1. Login to your account and go to the MY FORMS page. Click the form then click the SUBMISSIONS button. 2. On the Submissions Page, click the GEAR icon then tick the IP checkbox to display the user's IP address on the submission data. 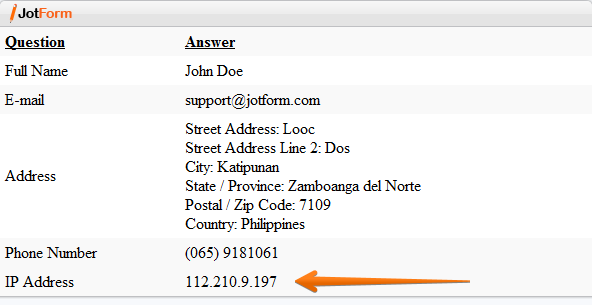 You'll be able to see the IP Address section from the window. You can also see the same information from the grid listing below. 1. When setting up Email Notifications, add the IP ADDRESS tag in the email content. 1. 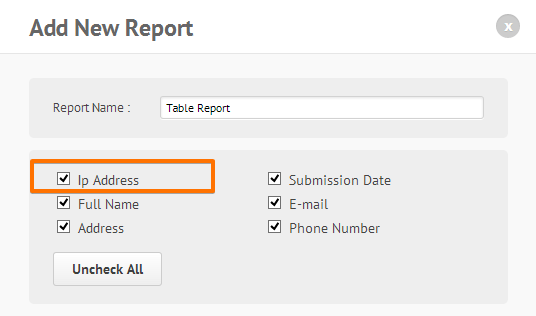 Let's say you will create an HTML Table Listing Report - On the Add New Report wizard, make sure to check the IP Address checkbox. This is no longer an option. Can it be found somewhere else? I would like to enable the IP Address option, however I also receive an "error on page" message. Can this be fixed please? Thank you. tried this but the settings icon only displays an error on the page.